A man raises his hands during a protest in support of a new EU migration policy, a day before an EU leaders' meeting, in Brussels, Belgium, Dec. 13, 2017. Political pressure is growing on the European Union from some member states to rethink freedom of movement rules and to start introducing restrictions to stem what they see as disruptive migration. The latest challenge doesn’t lie with the refugee crisis and the irritation with non-EU migrants easily moving across the continent and cherry-picking which European state to try to settle in, but the concern that migration between EU countries is further depopulating economically depressed regions and towns, condemning them to a gloomy future of being "left behind" permanently. 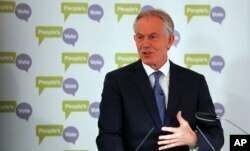 Last month, the pro-EU former British prime minister, Tony Blair, added his voice to the idea that free movement should be re-thought. Blair, who is campaigning for Britain to hold a second referendum on whether to leave the EU, said a rethink could help Britain remain in the Brussels bloc under new membership terms. Britain's former Prime Minister Tony Blair makes a speech on Brexit at the British Academy in London, Dec. 14, 2018. “If you take freedom of movement and the question of immigration, this is an issue all over European politics today,” he told the BBC. Many Britons who voted for Brexit cited free movement as their main reason for wanting to quit the EU. Freedom of movement is one of the 'sacred' pillars of the EU’s single market and seen by Brussels as crucial for European integration. Many younger Europeans see it as a birthright, allowing them to travel, work and study in any EU member states they want. And millions have embraced the opportunity to relocate. But central and southern European member states have seen a hollowing out of their populations, thanks to youth emigration, which in turn is putting a brake on their economic growth and leaving behind ghost towns inhabited by pensioners and the less-skilled and resourceful. Left with aging populations, countries that have seen high levels of migration are finding there are fewer young working taxpayers to fund increased health care and pension needs. In the past 20 years, more than 3.6 million mostly young Romanians have left their native country. And a recent survey suggests that half of all young people still living in Romania have concrete plans to leave. Since Poland joined the EU in 2004, more than 2 million Poles have left. FILE - Biruta Kadakovska (R) talks with migration researcher and social anthropologist Dace Dzenovska during an interview in Malnava, Latvia, Feb. 29, 2012. Latvia's census data of year 2011 shows that in the eastern regions of country, population decreased up to 30 percent. Last year, the Latvian government appointed an ambassador with the main task of wooing Latvians back home. Next door, Lithuania has also experienced an exodus, seeing its population shrink by 17.5 percent. Blair isn’t alone among prominent European politicians to question whether it is time for a rethink. In November, Romania's finance minister, Eugen Teodorovici, warned that migration of many young skilled Romanians is having deleterious effects on the country by causing a "brain drain" from some industries. “If someone goes to Germany and keeps getting the right to work, then he will never return to Croatia or Romania, where he left,” he said. “We need to learn at the European level that as one area becomes poorer, another becomes richer,” he added. Teodorovici argues young Europeans who have migrated should be issued with five-year work permits, after which they would have to leave and possibly return home. His remarks prompted uproar both in Romania and Brussels. But some other Central European governments are exploring ways to entice back workers, including considering offering financial incentives to encourage youngsters to return. Advocates of free movement say migration fears are being overblown, arguing money workers send back to their families is crucial for depressed regions. They point out depopulation is being caused as much by low birth rates. Many youngsters eventually return, they say, often coming back more skilled, affluent and entrepreneurial, which adds to development potential in their home towns. According to the Central Statistical Bureau of Latvia, the number of emigres returning home in 2016 was about 40 percent of those who left. Efforts to limit freedom of movement are likely to fail, with young Europeans especially critical of the idea that there should be within Europe free circulation of money, goods and services but not of labor. Atis Sjanits, the Latvian diplomat charged with enticing young Latvians back home, has argued that changing the rules now isn’t possible. He says the focus should be on making it more attractive for emigres to return.